Shopping online by typing what you want in a search prompt may soon be a thing of the past — at least on eBay. 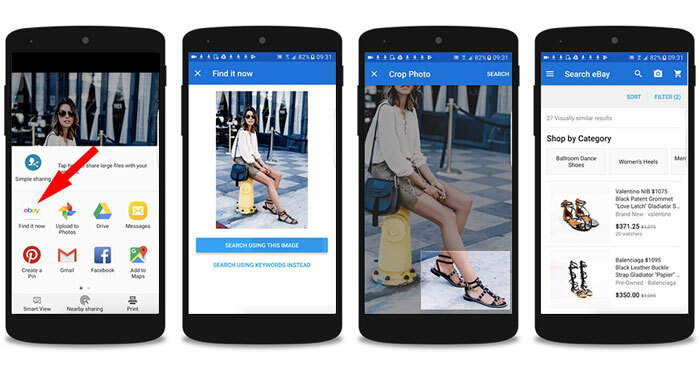 The auction site thinks photos are the way of the future, and its mobile apps (free for Android and iOS) now offer two new tools to let users search with images rather than words. That means you won't have to spend any time coming up with the right search keywords: all you have to do is grab a photo and eBay will point you directly at the right products. The new search functionality comes in two flavors: Image Search and Find It On eBay. Image search is just a new option in the standard search box, allowing you to snap a photo or select a photo from your camera roll to search. Find It On eBay lets you grab images from other websites, like Pinterest or Facebook, and use them to search. Though it's a bit less straightforward than dropping a picture into eBay's standard search, it's pretty streamlined: just tap on a picture and share it with the eBay app. Then, just crop the photo to focus on the item you want, and search away. eBay will sift through over a billion items to find similar products — though just how similar will depend on the photo and the item. A search for a pair of shoes, for example, will give you shoes with a similar style, but may not necessarily be the same shoes. Shopping by image may seem simple — after all, isn't that what we do when we browse search listings ourselves? — but it's taken a lot of technology for eBay to put this together. This smart search is powered by artificial intelligence and machine learning, letting eBay's computers digitally "look" at millions of images to compare them to yours. And, trust us, computers can browse the virtual store shelves a lot faster than you can, which could save you from frustrating hours of searching for the perfect buy. Image Search is available for both Android and iOS, while Find It On eBay is currently limited to Android. However, don't feel left out, iPhone users: instead of tapping on a photo and sharing it with the eBay app, you can take a screenshot (press the power and Home button simultaneously for most iPhones or press the Volume Up and the On/Sleep simultaneously for iPhone X), save it to your camera roll and then use it to image search. But no matter which app you use, using your photo library makes searching much easier.